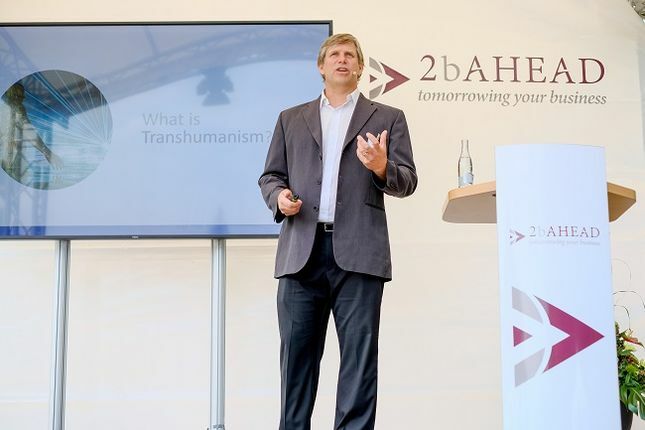 Zoltan Istvan, ehemaliger National Geographic Journalist, Gründer der Transhumanist Party, Autor des Romans „The transhumanist wager“ und Keynote-Speaker auf dem 17. 2b AHEAD Zukunftskongress, ist der Meinung, dass wir durch Implantate Teil der Maschinen werden müssen, um nicht von der Künstlichen Intelligenz überrannt zu werden. Nach seinem Vortrag hatten wir die Möglichkeit, mit ihm eingehender über seine Perspektiven zu sprechen. Wie werden wir den Fortschritt zu unserem Nutzen gestalten, um die Beschränkungen des menschlichen Körpers zu überwinden, und was wird es bedeuten, wenn wir uns diesem Fortschritt verweigern? Hier einen Auszug aus dem Interview. 2b AHEAD: You mentioned resistance to transhumanism in different cultures, in different countries – where do you see a time frame where things even out more? Zoltan Istvan: Well, to be honest with you I don't know if I actually have a time frame for when this evens out. This might be a story that gets worse and worse and worse, where in five years there are clashes on the streets, they are already happening, but I think in 5-10 years in America you start having demonstrations, you start having riots. […] I think that kind of conflict continues to the next 20-30 years and perhaps gets worse and worse. And at some point even the really smart people, the doctors, the lawyers – they start getting replaced by machines, automation and then transhumanism becomes I think a full revolution, where it's really technology versus humanity. But in the end, there are so many benefits coming from transhumanist technology, that I think it wins and I think what's really important is the governments figure out a way to give people a livelihood – even if they cannot work, because robots or automation is taking off. If the governments can figure out a way to do that peacefully, then I think we could all live in a techno-utopic world full of transhumanist technologies and maybe even have the benefit of not having to work anymore, of a much more leisurely lifestyle. 2b AHEAD: You mentioned in your keynote the tension between the coexistence of humans and machines – we have with Michihito Matsuda someone who has had an AI as a mayoral candidate that has a relatively close projection of a AI taking over political leadership from humans. What do you think of this point? Zolta Istvan: I think this is absolutely the future and I think of it – for a number of reasons to be honest – I actually think having politicians that are robots that make decisions based entirely on this principle "the greatest good for the greatest amount of people" is exactly what democracy is really about. […] If we had a machine intelligence at the forefront of our government, the people could rest assured that the machine intelligence is going to take the greatest amount of people and do the greatest amount of good based on algorithms. Right now that's not happening. Our presidents are taking lobbyist money, they're thinking about being re-elected, they're thinking about how to get their ideas put forward – which are personal idiosyncrasy, like personality traits. […] What I want is a machine intelligence to do what is the best for all society – that is democracy. Democracy is not a president making choices based on his own opinion. 2b AHEAD: We've had a long-term study, 'The future of your children', where we look 100 years into the future – and one of the theses that we engage with is the view, that it's possible through technologies, technology a whole to enable – theoretically at least – immortality. And you've mentioned this is something, that you think is a core goal, a core achievement of transhumanism – what do you see the technology is taking us forward here or how do you see this journey from here to a tech-based immortality? Zoltan Istvan: Well I think, basically we have these companies working on these brain implants, now in California and you know, Elon Musk has a lot of money and a lot of success in the stuff and the bottom line is: if any of these companies have any success the next 5-10 years, I think both will. That's sort of the end of the human mind being not connected. Once you connect to the internet, why would you ever go back? For example, this recording we're doing, this interview, we would do it in our brains and we wouldn't need to be near each other, and it would be so much more efficient, so much more streamlined, and the point is that – I think once we connect, we will never disconnect, because the advantages are way too great. It's almost like when to start using the gas engine, combustible engine versus horses. It’s like: "Wow, there's really no reason ever to use a horse again." 2b AHEAD: Very cool. Well thanks a lot for joining us, thank you for your thoughts and input and thank you for your time now and we look forward to following what you do. Zoltan Istvan: Thank you so much for having me. Hören und lesen Sie das komplette Interview hier.